Have you noticed the Graceful Glass Designer Vellum in the new Annual Catalogue? It has some lovely images and patterns, perfect for accenting your project, or becoming the main event. 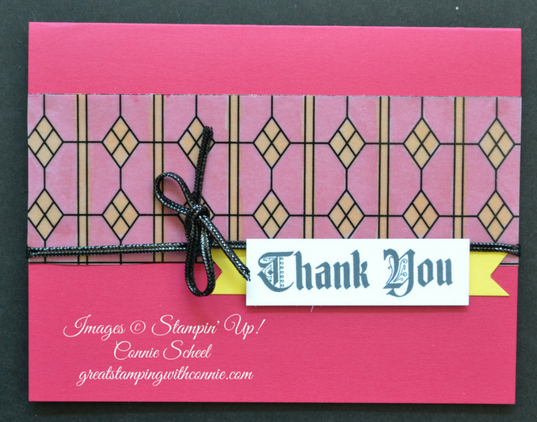 It works really well on top of boldly coloured card stock such as Lovely Lipstick in this card. As a demonstrator, I got to play with this vellum back in April, as this was one of Make n Take cards at our OnStage event. I love how well the Lovely Lipstick pairs with the bright yellow Pinapple Pumch. Check out page 164 - 165 in the annual catalogue to see all the great products in the Graceful Glass Suite.